This is part 3 of 5 of my Crushing It With Video series on how to create awesome videos for your online business. Every single day, I see people asking, “What microphone should I buy?” and they almost always get the same answer. When I needed a microphone for my business, I knew exactly what microphone I wanted. I’ve been hanging out in lots of forums and Facebook groups doing market research and I knew what was good and what was not. However, for many of you, your choice of microphone may not be so clear. 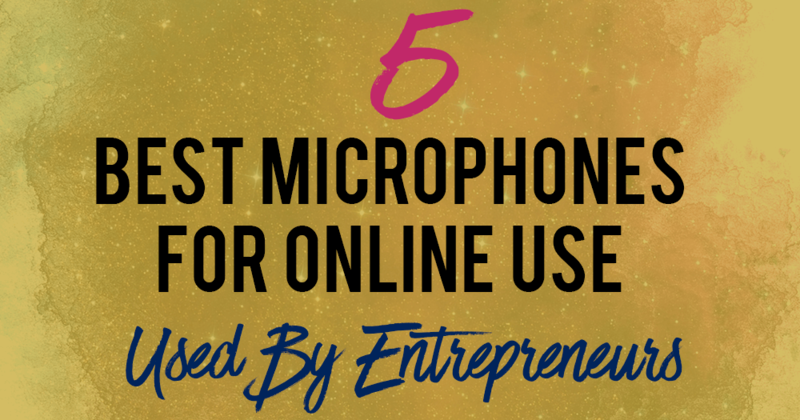 These are the top few microphones that I’ve seen entrepreneurs rave about repeatedly. 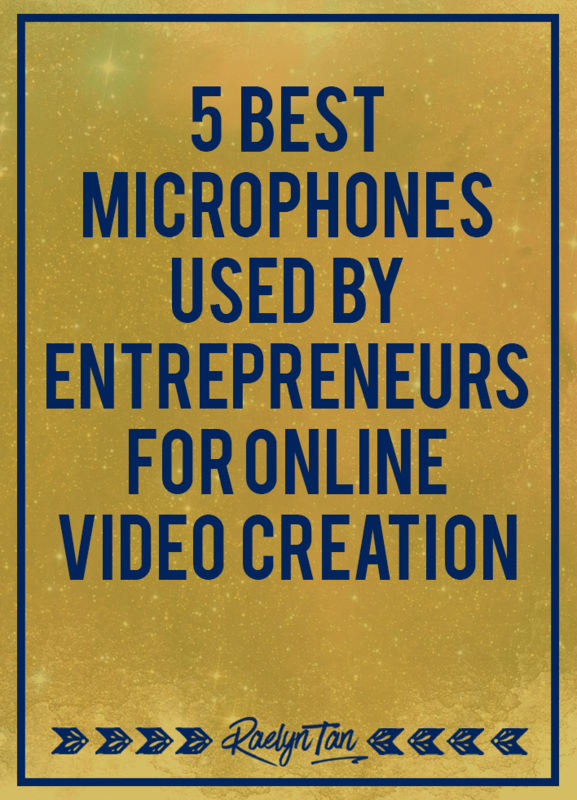 You can’t go wrong with any of these microphones to film your online videos. For your convenience, I’ve also added in my personal evaluation for each microphone from my experience. What to use if you want to start a podcast/ run webinars/ film online tutorials/ film with your phone and more! Disclaimer: Some of the links here are affiliate links and I’ll receive a small commission if you purchase (to finance my Starbucks addiction), at no cost to you. The Blue Yeti Microphone is by far the most popular choice. I own the Blue Yeti myself. Many entrepreneurs start out with that and declare that they love it. It’s functional, pretty and gives you a great sound. 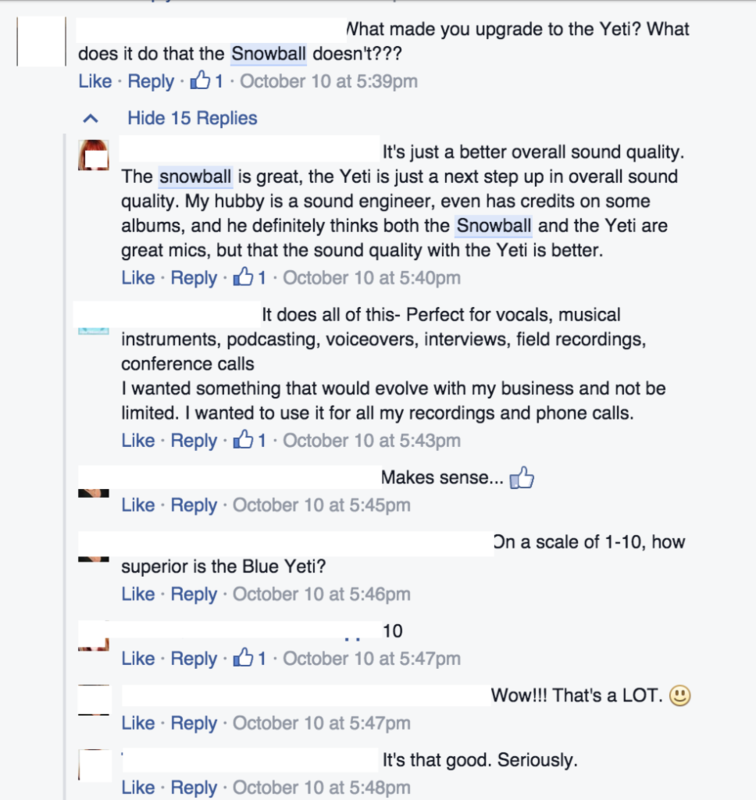 Just some exclamations of love for the Blue Yeti from online entrepreneurs I see on a regular basis on Facebook… (I’ve blurred out their names and photos for privacy purposes). 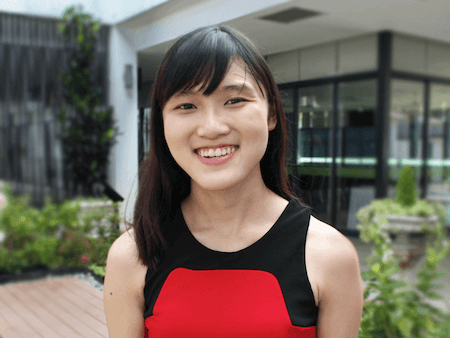 It is also great for webinars and creating online tutorials. I personally use it and love it. Check out my tutorial for the Blue Yeti Microphone here. Check out the Blue Yeti Microphone on Amazon here. The Blue Snowball is for people who feel that the Blue Yeti Microphone is too expensive. It’s more affordable than the Blue Yeti, but you’ve to put your mouth real close to the Snowball for it to sound loud enough. I’ve seen people use it and put their mouths super close and it looks weird – maybe they just don’t know how to use it? However, it gives superb quality sound for its price. If you’re on a budget, it’s a fabulous microphone to have. The difference between the Blue Snowball and the Blue Yeti? The Blue Snowball is cheaper than the Blue Yeti. The Blue Yeti has better sound quality and takes in less noise. Blue Yeti VS Blue Snowball? It comes with a cute little stand for the Snowball. Note: This is the regular Snowball, not the Snowball Ice. The regular snowball has an ambient switch which reduces the amount of noise the microphone takes in. Unfortunately, it still takes in more noise than the Blue Yeti, but it’s great quality for the price. Check out the Blue Snowball here. The Rode Smart Lav+ is hands down the most popular microphone for people who’re looking for a microphone that clips to their shirt. It’s a lavalier mic. Check out the Rode Smart Lav+ here. I have this too! I use it when I film videos with my DSLR camera: It plugs directly into my Canon T3i Camera. The sound quality is excellent. It works very well in windy weather due to its shock mount. Check out the Rode Videomic Pro here. This is a big hit among podcasters. In fact, it is the recommended microphone by quite a lot of big podcasters. It has both USB and XLR outputs. 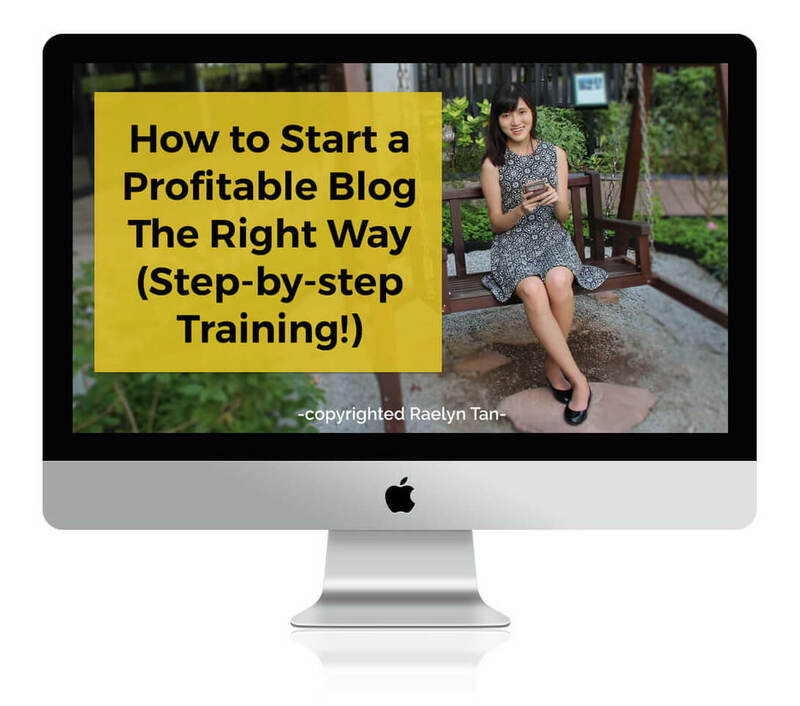 Pat Flynn, a blogger I love, recommends this for his podcasts. Check out the Audio Technica ATR2100-USB here. I personally use the Blue Yeti, and it has allowed me to film online videos, record online tutorials, host webinars and much more. I even bring it around when I travel because I need it for my business regularly. If I film on my DSLR camera, I also personally use the Rode VideoMic Pro, and it works like a gem. If you’re on a budget, the Blue Snowball works really well for the price it’s selling for. If you’re looking for a microphone for a podcast, Audio Technica ATR2100-USB has quickly become a must-have for podcasters. If you’re looking for a microphone that clips to your shirt (filming with your phone), you should go for the Rode Smart Lav+. There may be other options, but I’ve yet to see people raving about other microphones much. There’s probably a reason why. Alright, I just saved you a ton of time and energy by doing all the research for you. Onward with your video adventures! « How I Got Over My Fears to Finally Record My First Video Online!